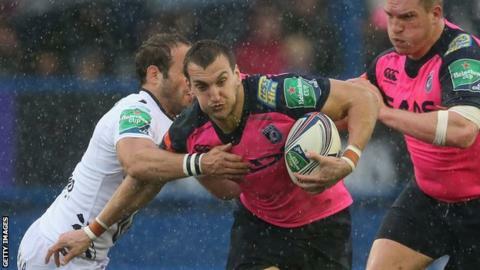 Wales captain Sam Warburton is confident he will have a team to play for next season. The 25-year-old signed a Welsh Rugby Union central contract in January and says he expects to continue to play for Cardiff Blues. But the four Welsh regions are currently unwilling to field centrally contracted players. "I'm just going to carry on as normal with the Blues. I have great faith that things will be sorted out," he said. "I've already sat down with the coaches and planned out what the plan will be for next season and I anticipate to carry on like normal. "I have to think that way otherwise it would be a bit of a mess around my mind really not knowing what's going to happen." The flanker dislocated his shoulder in Wales' 51-3 win against Scotland in the Six Nations in March. It means he will miss tests against South Africa in June. Warren Gatland's side kick-off their summer tour with a warm up match against Eastern Province on 10 June. They then take on the Springboks in two test matches, in Durban on 14 June and Nelspruit on 21 June. The 2013 British and Irish Lions skipper Warburton expects to be back in training a few weeks after the tour ends. "The rehabilitation's been really good," said Warburton. "My twin brother Ben is my physiotherapist for this period which has worked out really well for me. We can be honest with each other. "I'm hoping to get the all-clear in July sometime. It's pretty relaxed to be honest because there's no game to chase to come back for. "All I'm chasing really is to try and get as much pre-season in as soon as possible. "So I think after 12 weeks I can pretty much do full conditioning with the coaches. "I think the Blues get back together in June, so hopefully I can get a good two and a half months under my belt and go into September feeling strong and fit."